Youth Sports Safety Summit - Welcome to PT2Go! Youth Sports Safety Summit - Welcome to PT2Go! New York, NY September 19, 2014- As an orthopedic residency trained doctor of physical therapy who is passionate about my career in medicine, injury prevention and knowledge translation in academic medicine, it was a humbling experience to be surrounded by such an enthusiastic, knowledgeable and emotionally intelligent group of people advocating for one common goal: Youth Sports Safety. Brooke de Lench, the Executive Director of the MomsTeam Institute, and her team launched the inaugural Youth Sports Safety Summit in the Joseph B. Martin Conference Center at Harvard University’s Medical School. The conference perfectly coincided with Ms. De Lench’s directorial debut of The Smartest Team: Making High School Football Safer airing on PBS, Amazon Prime and Vimeo this Fall. The Smart Team program is modeled on the community-centric approach to improving youth sports safety expanding on the Six Pillar approach to all sports injury and concussion risk management. During the pilot-phase (Fall 2014) MomsTEAM Institute has selected leading researcher coordinators who are working with the following universities to bring the SmartTeams program into their communities: AT Still (AZ), University of Tennessee, University of Texas, Michigan State, University of South Carolina and the University of Tulsa. In collaboration with and input from all relevant youth sports stakeholders, the Institute has been designing and developing a set of comprehensive health and safety best practices, and will be awarding “Smart Team” status to Youth Sports Organizations (YSOs) which have demonstrated a commitment to minimizing the risk of physical and psychological injury and sexual abuse to young athletes by implementing the best available knowledge and data to provide current best practices. SmartTeams pilot program is for the Pre-HS athletes (ages 7-14). The Pilot programs will be for select football teams and the national rollout will be with all sports teams (soccer, ice hockey, baseball, lacrosse, etc) in 2015. During my decade of formal education and subsequent years practicing, I’ve learned that the world of medicine can have similar governmental “bipartisan issues” of not reaching across the aisle to help out a fellow clinician. The “great ones” across all aspects of medicine seem to have common attributes- professionally and personally. A clinicians ability to listen and be appropriately empathetic while having passion for their field of medicine is rare. Couple this with the desire to learn from others from multiple disciplines and this empirically leads to success for patient outcomes, professional growth, and knowledge translation. 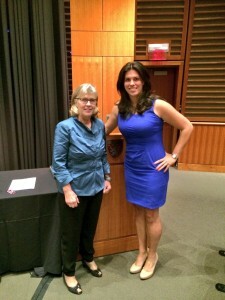 I was both humbled and impressed by Ms. De Lench’s passion and abilities to put together such a comprehensive summit from all walks of life ranging from Harvard physicians, collegiate athletic trainers, an internationally recognized physical therapist, lawyers, neuropsychologists, nutritional experts, motivational speakers, and professional athletes all coming together with the common goal of addressing the youth athlete from an all encompassing holistic approach of mind, body, psychological, emotional and sexual well-being. I am so very fortunate that I am able to surround myself with inspirational individuals across all aspects of medicine who are innovators in their fields via connections I have made across social media, residency, academia, and alongside my colleagues and associates I am lucky to work with everyday. It is apparent that Ms. De Lench has similar attributes and has also surrounded herself with a strong group of individuals from all over the country. The central tenet from the inaugural MomsTeam Youth Sports Safety Summit was that it takes a village…or in this case a team of individuals from all walks of life to come together to advocate to the masses from a grassroots level. If we practice solely in these silos that we set up for ourselves professionally across medicine, law, athletic training, coaching, government policy, and education then we will never be able to reach whole communities in such a positive way in which change needs to occur culturally, fiscally, and individually for the safety of our athletes. I commend the incredibly comprehensive and still growing team of MomsTeam Institute for advocating and making change for the safety of athletes all across the United States. Cheers to the continued growth, advocacy and gusto of all the participants who made the inaugural Youth Sports Safety Summit such a positive and educational experience. • Sport specialization in early puberty develops the player, not the athlete. Rosemarie Moser, Ph.D., ABN, ABPP-RP: Cognitive Rest: Is It Really Best? Holly Silvers, MPT, PhD(Candidate): Injury Prevention in Youth Sports: Can We Increase Coaching Compliance and Design Cost-Effective Prevention Programs? Neeru Jayanthi, MD: Keeping Up With the Joneses: How Much Is Too Much in Youth Sports? • Adults don’t have the market cornered on emotional maturity. We have to manage ourselves so we can role model for our kids. • Coaches are educators. If we have student-athletes than we need teacher-coaches. We can’t just put a whistle in a math teachers possession and expect greatness. This entry was posted in Concussion, Multidisciplinary Medicine, Nutrition, Op-Ed. Bookmark the permalink.